After crawling through dozens of job postings online, you’ve finally found the insurance job of your dreams. Now its time to submit your resume and cover letter letting the hiring manager know just how wonderful you’d be for the position. You want to put your best foot forward when applying for this dream job, but how can you ensure your resume is ready? Avoiding these common resume pitfalls is the first key to success in landing your dream insurance job. It goes without saying that every job has duties, so there is no need to bore the hiring manager with a list of your weekly assignments. Instead, impress them with your accomplishments. Job duties show hiring managers what you did, whereas job accomplishments show hiring managers what you achieved (and consequently, what you can bring to their organization). Did you stand out from other employees? If so, then why? Did you win any awards or accolades while employed? Were you responsible for implementing/improving processes? Did you save the company any money? Once you have your list, add tangible numbers to quantify your accomplishments. For example, improved sales by 15% year over year. 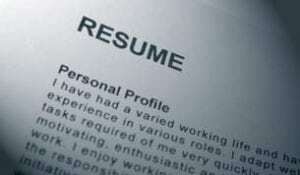 Many people blindly send in resumes hoping to get a response from any company that is hiring. This is almost always a bad move. Hiring managers know the difference between someone who is serious about a job application and someone taking a shotgun approach to employment. Make sure your resume is targeted and appropriate for the position in question. Ensure your resume communicates your career progression: if your job history includes job-hopping or appears transitional, make sure you highlight the transferable skills. If some of your previous experience is not applicable to the application, don’t include it. Make sure your resume and cover letter uses important industry keywords. Many companies have a screening process when reviewing applicants that exclusively looks for resumes with their desired keywords. If you’re resume does not make use of these words, you may be overlooked. Keywords can include anything from specific skills, experience and education. If you’re not sure which keywords are important, take a look at the job posting. For instance, if you’re applying to insurance customer service jobs and the posting calls for a candidate who can work independently or possesses a strong ability to interact with clients, ensure your resume reflects and mentions these skills. Every resume should include a cover letter, regardless of whether or not the job posting specifically requests one. At best, the hiring manager will briefly skim your letter if one was not required. At worst, your resume will be completely overlooked for not including one if it was expected. Cover letters are great marketing tools where you can promote your skills and abilities outside the standard format of a resume. It can also be an opportunity to expand on your resume, explain inconsistencies in dates or highlight accomplishments in more detail. Each cover letter should be tailored to each specific job application – in this instance, one-size fits all is not appropriate. Ensure your cover letter speaks to the position in question: why are you the best candidate for the position. What can you bring to this specific company? Avoid using cookie-cutter responses. Always be sure to proofread your resume. In addition to looking for grammatical errors and mistakes with your contact information, make sure your resume also uses an active voice with action words. Don’t be afraid to let your enthusiasm for the position shine through – you’re the best person for this position after all. Your resume is your first chance to make a great impression on a potential employer. With the vast amount of candidate competition for employment opportunities, insurance resumes need to be in tip-top shape. There is no room for errors. Put your best foot forward by presenting the best possible version of yourself in order to land that dream insurance job.